Checking the news a few days ago – and by news I mean Perez Hilton and E! News – there were two significant celebrity break-ups: Calvin Harris and Taylor Swift; and Zayn and Gigi Hadid. And so many broken hearts. With that, I am dedicating this recipe to these couples that are now in the past and to any one whose heart is broken. Why? 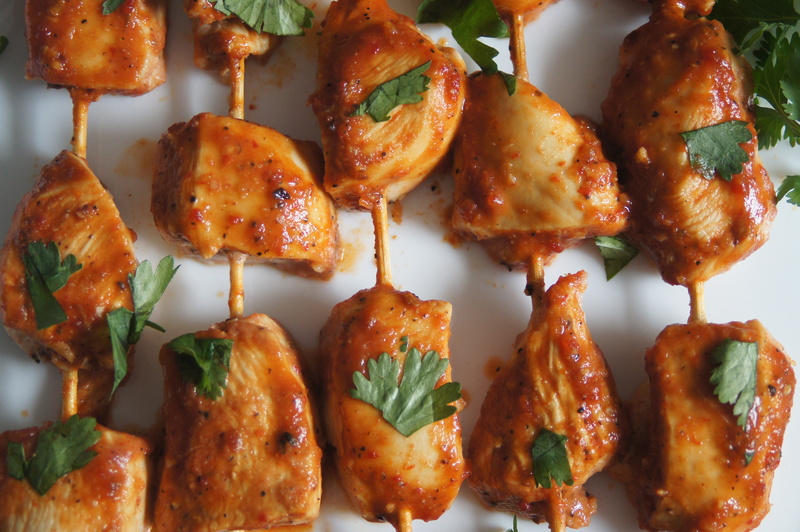 Because these pieces of chicken are skewered – just like those hearts. But I bet if Zayn, Gigi, Calvin, and Taylor made these and ate them they wouldn’t be broken hearted for long. For starters, you have to squeeze at least six limes to make ½ a cup of lime juice and all that squeezing is a good way to get some aggression out. Once you add the lime juice to the chipotle peppers, garlic, chili sauce, and other ingredients and put them through the food processor the smell is so nice. It literally is aroma therapy. It takes two hours to marinate the chicken and in that two hours Taylor Swift can begin writing a song about Calvin Harris. Or if she needs extra time she can marinate the chicken overnight. That’s what I did. But I didn’t write a song. But if I did I would ask Sam Smith to sing it with me. And it would be a huge hit. And if they’re too sad to step outside and prepare their grill, they can just broil the chicken skewers in the oven. In 8-10 short minutes their skewers will be done and their healing can begin. Add all ingredients into a food processor and blend until smooth, then season with salt and pepper to taste. On a cutting board, cut the chicken into 1-inch pieces, then transfer them to a medium bowl. Pour a ½ cup of the marinade over the chicken, cover the bowl with plastic wrap and set it in the refrigerator for 2 hours or overnight. When chicken is ready, preheat the broiler, or if you’re using an outdoor grill, prepare a medium-hot fire. 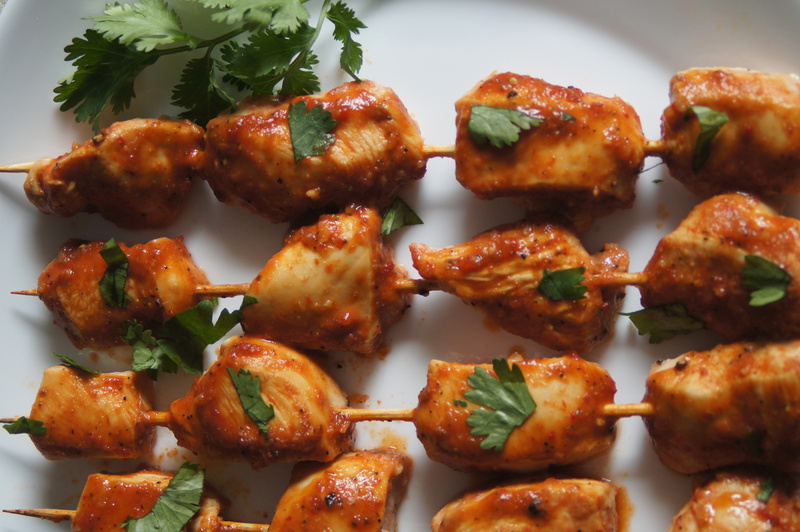 While grill or broiler is heating up, slide 3-4 pieces of chicken onto each skewer. Continue until you’ve filled all 20 skewers. Transfer the skewers to a large baking sheet and line them up in a single layer. Season the chicken lightly with salt and pepper and brush it with ¼ cup of the marinade. 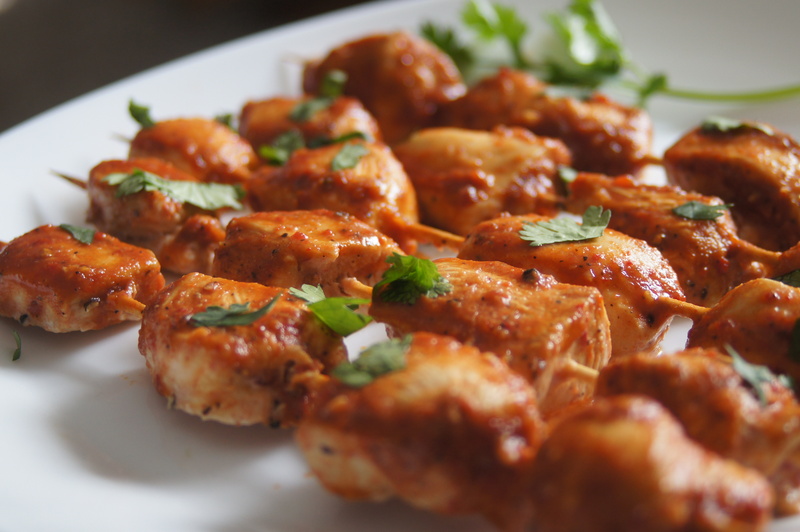 Broil or grill the chicken skewers without turning them until they’re cooked through, about 8 to 10 minutes. Transfer the cooked skewers to a platter. In a small pot, heat the remaining marinade on medium low just until it boils. Garnish the skewers chopped cilantro, if using. Serve with the heated sauce.